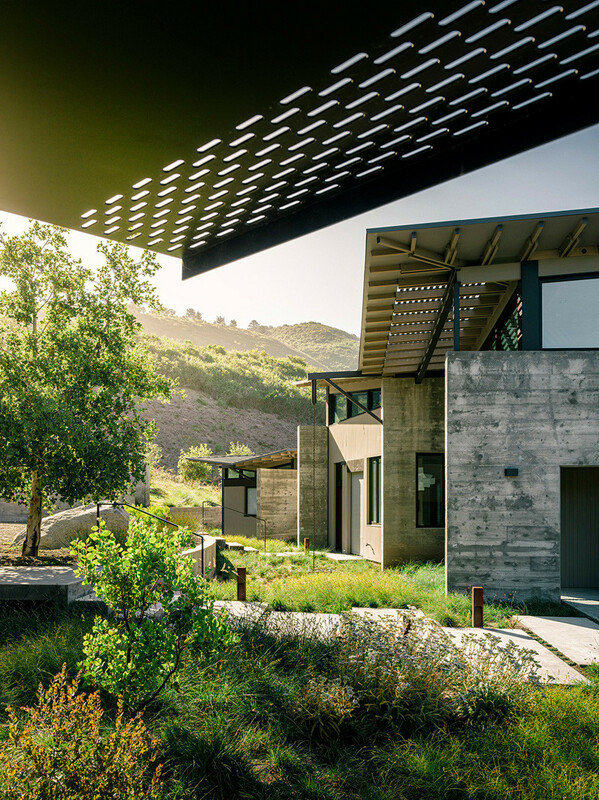 Feldman Architecture were approached by their clients to design a retreat for eventual retirement and visits from their grown children, at a site near Carmel, California. 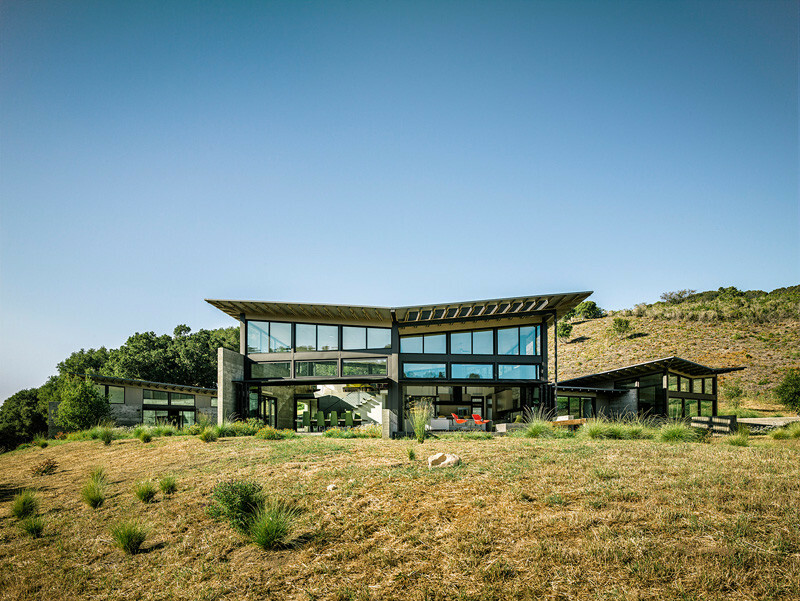 When designing the home, the architects were inspired by the clients mention of seeing butterflies in the meadow. 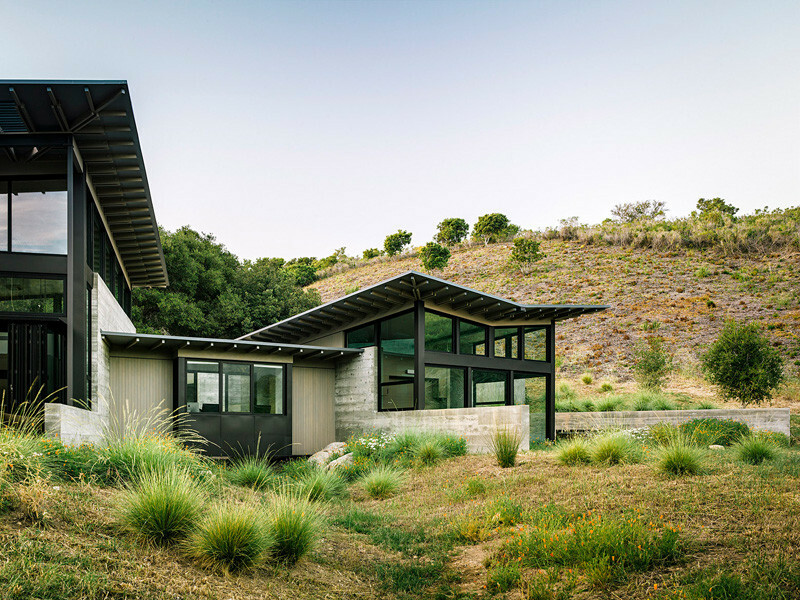 You can see the result of this inspiration in the various roof lines of the home. 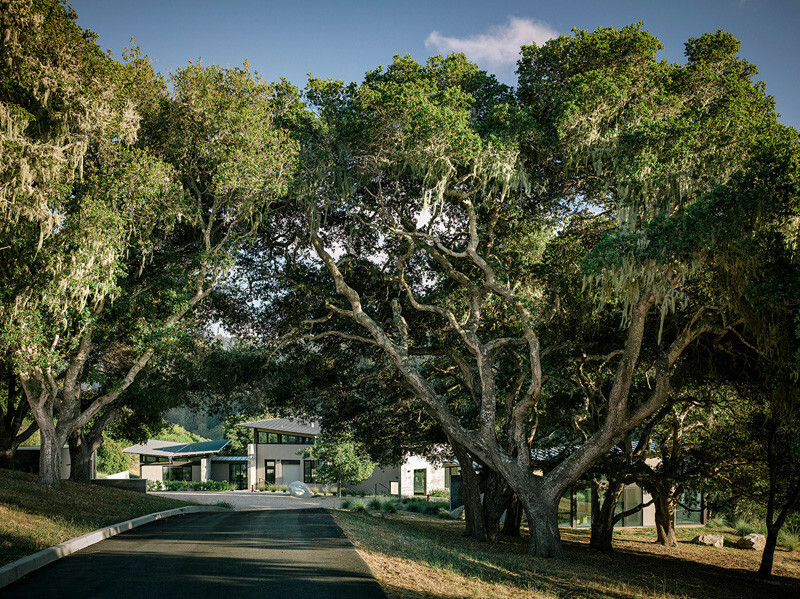 The architects worked with Bernard Trainor + Associates to design the surrounding landscape design. 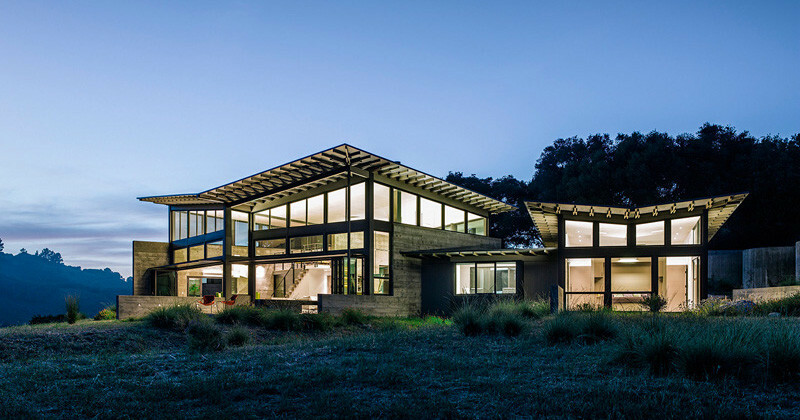 Water conservation has been thought about with the design. 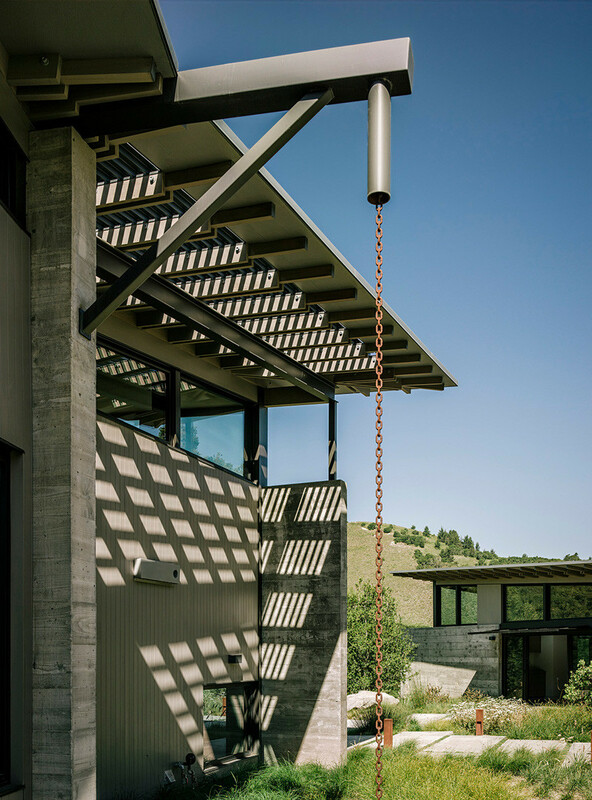 Each roof funnels water to a rain chain fountain, and into landscape collection pools, which then gather in cisterns where it is stored and used to irrigate the landscape. 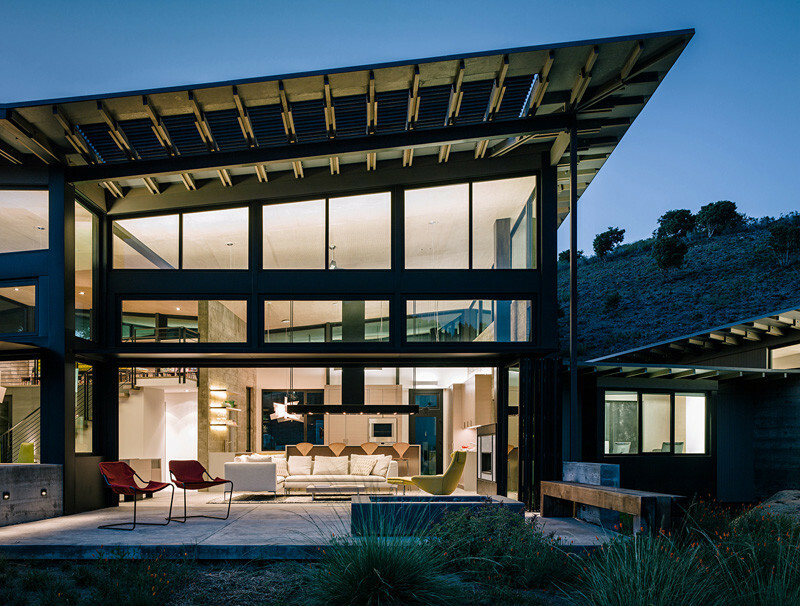 Each part of the home has a separate function. 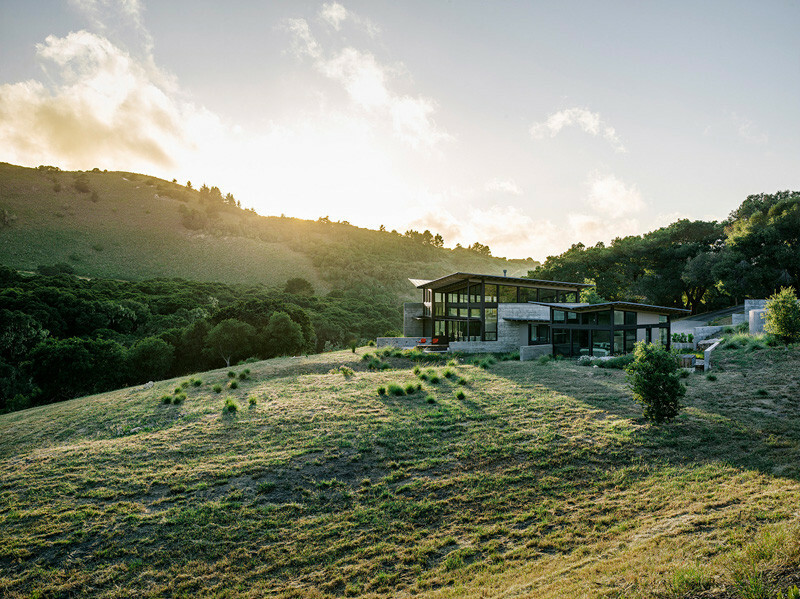 The central pavilion houses the main living, dining, and cooking spaces, while two other pavilions provide for sleeping, bathing, and relaxing. 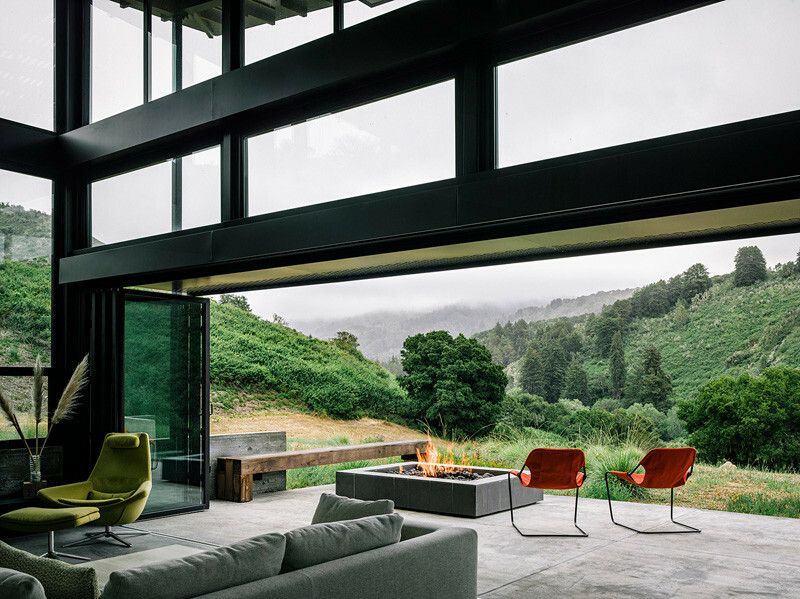 Seating around the outdoor fire pit provides views of the Santa Lucia Preserve. 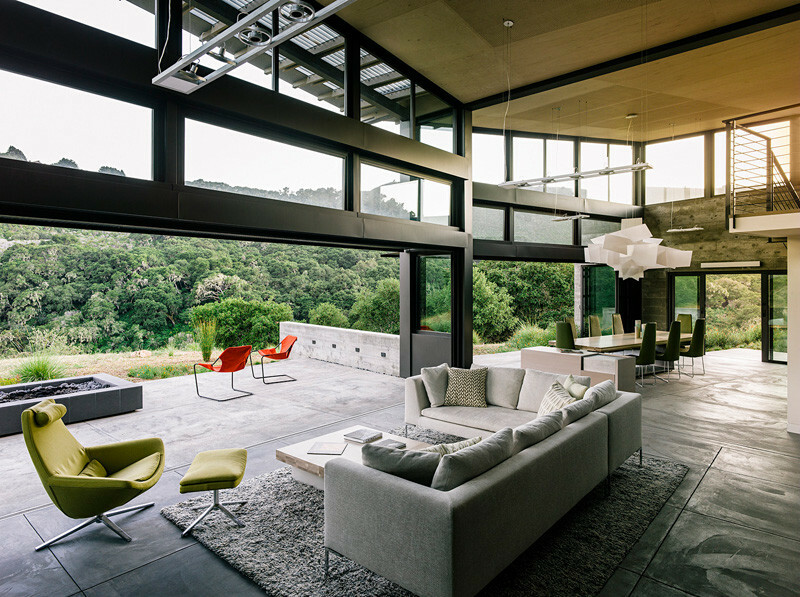 The clients also expressed a desire to have a home with integrated indoor and outdoor spaces. 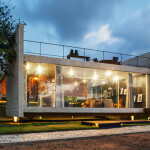 This was achieved by making the walls in the living and dining areas open to the outside. 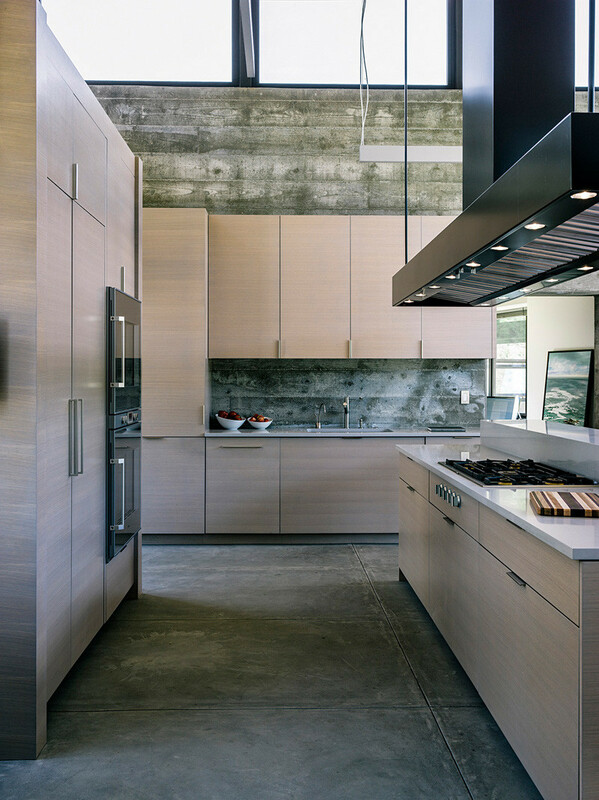 A simple yet elegant kitchen, provides plenty of space to prepare a meal. 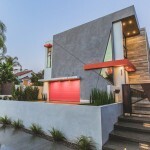 The home features a lot of concrete throughout, with it mostly being left with a raw finish. 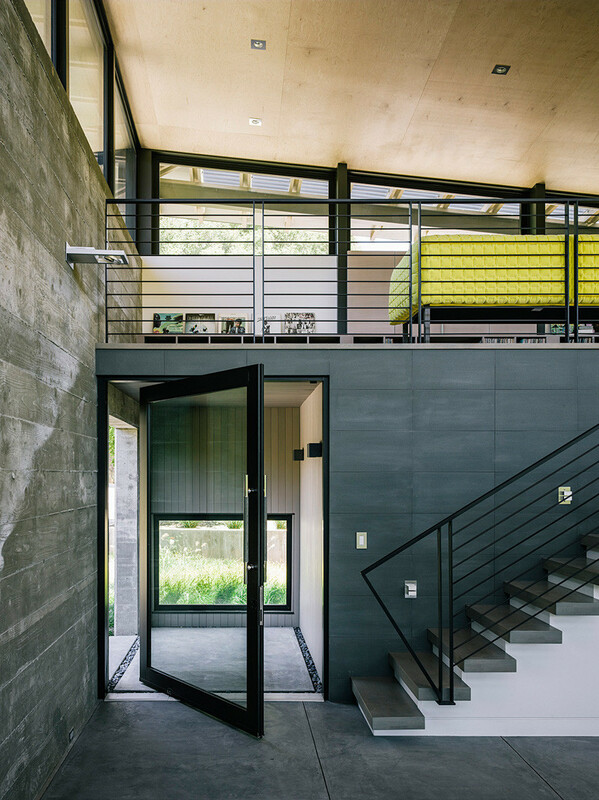 A large glass pivoting door is located right next to the stairs. 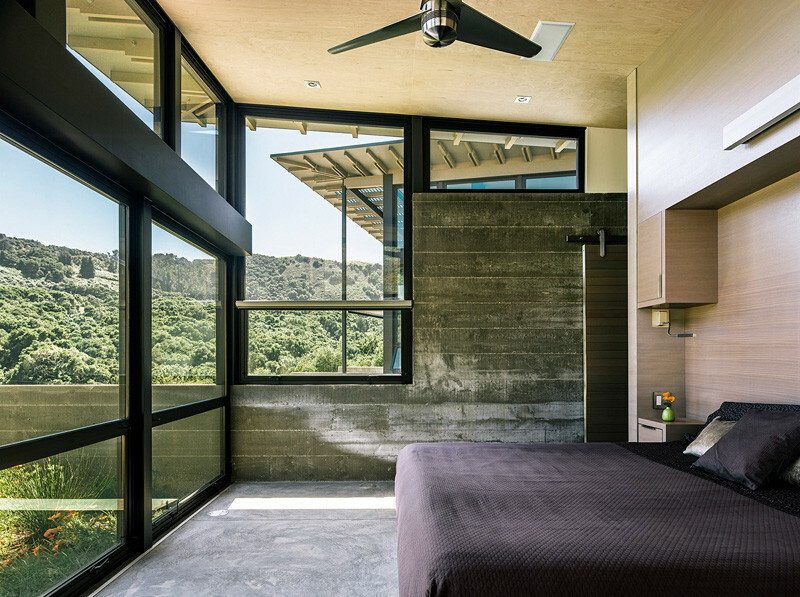 The bedroom has a palette of concrete, glass and plywood, with the main focus being the view from the windows. 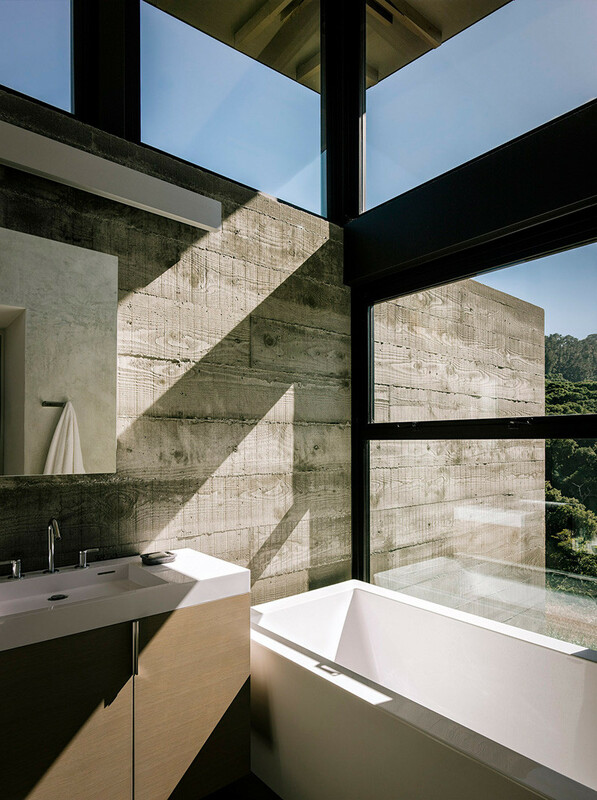 In the bathroom, you can see how the concrete flows seamlessly from the inside to the outside.